The game follows the movie\’s storyline loosely, and is compelling in gameplay, as well as challenging, but the graphics are not up to par with the current excellence. There are about 15 different weapons in the game, each with two weapon modes, and there are about 10 gadgets. This highly diversifies the game\’s gameplay, and the multiplayer modes even the gameplay out. The multiplayer modes incude: King of th Hill, Team King of the Hill, Uplink, Golden Gun, and Standard. All of these modes can be changed according to the weapons you choose. There are also characters to be unlocked. 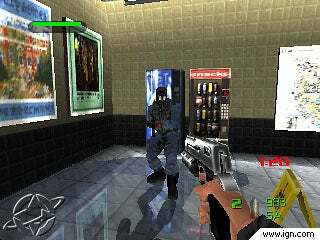 The main mode, single-player, has 14 levels, each with three difficulties: Agent, Secret Agent, and 00 Agent. These extra difficulties add depth and replayability to the game, yet do not enhance gameplay, save for extra mission objectives. I must dock this game for on the appropriateness level because of the cleavage shown, the amount of violence, and an easter egg my friend and I discovered in multiplayer, in which a really injured player will have bloody hands with no skin on them.